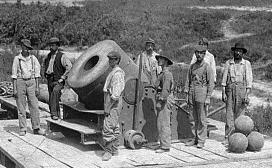 Prints and Photographs Division, Library of Congress This 17,000 pound 13-inch seacoast mortar was mounted on a railroad car and used during the seige of Petersburg in 1864. Manned by Company G 1st Connecticut Heavy Artillery, this weapon could send a 200 pound shell two and one-half miles, using 20 pounds of gunpowder. In total, the Dictator fired 45 rounds, including 19 rounds fired during the Battle of the Crater. The Dictator was caste in 1862 at the Fort Pitt Foundry. Gardner, Alexander. Gardner's Photographic Sketch Book of the Civil War. Miller, Francis Trevelyan. The Photographic History of the Civil War, Vol. 5.